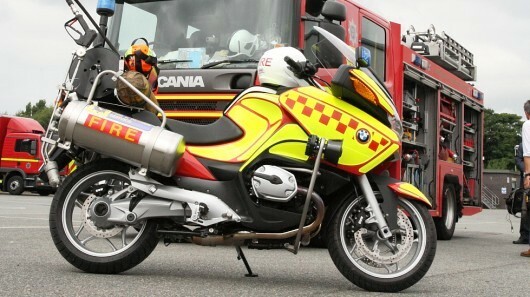 Firexpress has in cooperation with BMW developed a fire fighting motorcycle built on a German made BMW R 1200 RT motorcycle. With its high speed and easy manoeuvrability, the motorcycle is the optimal solution when the fire fighter faces the challenge of being a great distance away from the fire and narrow environment, e.g. congested traffic has to be navigated. Due to the limited width it can pass other road users by driving between road lanes to get through traffic jam fast. It is also used in tunnels where fires inside the tunnel cause traffic to form long queues. The Firexpress fire fighting motorcycle has a self-contained system with two interconnected 25 litre tanks for premixed water and foam. The system is driven by compressed air delivered from a composite material 6.8 litre air tank filled to 300 bar. The pressure of the air is reduced to 20 bar before it enters the water tanks. The air forces the water into a 30 metre hose, which is connected to the Firexpress lance. The fire fighting motorcycle has been tested for structural integrity and rider stability by BMW Germany, who has approved it and guarantees the warranty. It is based on the police version of the motorcycle with emergency lights, horn, radiator fan, front protection bars, and radio signal interference suppression system from the factory of BMW. A separate battery and wiring is installed for running the extra electric equipment. The police version of the motorcycle is fitted with an alternative rear axle that has a higher gear ratio. The higher gear ratio increases the acceleration at slower speed, which can be a necessity during emergency driving. One of many Firexpress fire fighting motorcycles acquired by the Hong Kong Fire Services Department over the latest 15 years. One of the Firexpress fire fighting motorcycles of Merseyside Fire and Rescue Service, Liverpool in the United Kingdom.